Guests and employees will love this Matcha Green Tea Latte concentrate. Tazo is all about the unexpected and our blends are no exception. 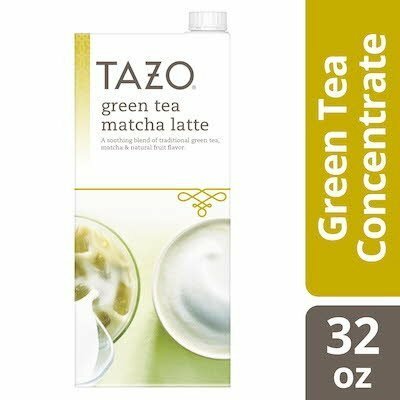 Tazo Matcha Green Tea Latte is a soothing blend of traditional matcha and green tea blends with a fruity kick. Our blend includes a Green Tea blend which is a mild tea with a fresh taste and a bit of sweetness; a Matcha which is a naturally sweet green tea powder known to lift spirits; Peach adding a luscious, succulent fruit sweetness; and Apple adds crisp juicy sweetness. Easy-to-use concentrates create delicious latte beverages as easy as 1, 2, 3 with a simple shake, pour and blend. Add ice for iced lattes and heat milk for a hot latte variation.